The too-common practice of backporting makes anything based upon a version check unreliable and prone to false positives. This information would be much more useful if you mentioned that you need the script and where to find it and any other libraries etc. As it is it is useless. The script (ssl-heartbleed.nse) is in the latest version of nmap, as of today, anyways. I didn't need to download any additional files. 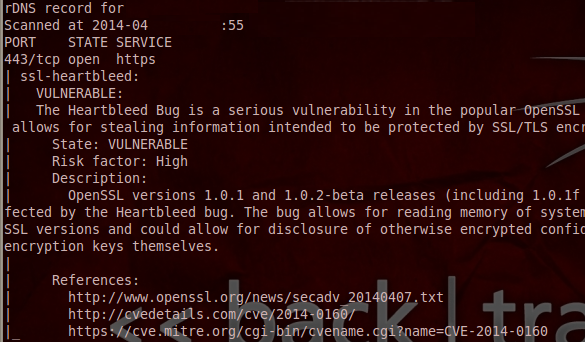 The ssl-heartbleed.nse in nmap 6.46 will scan for the issue on ports other than 443. The original version did not, and had a few other issues.